Since this arrived I have been putting this fleece through its paces in the variable English spring weather, even before the recent unlikely sunny warm spell (so useful having under arm vent zips!). Made of Double Superfine fleece (390gm2) the Patriot Heavy Fleece copes well with both wind chill and the occasional light shower keeping the wearer both warm and dry (those arm vents certainly get used). 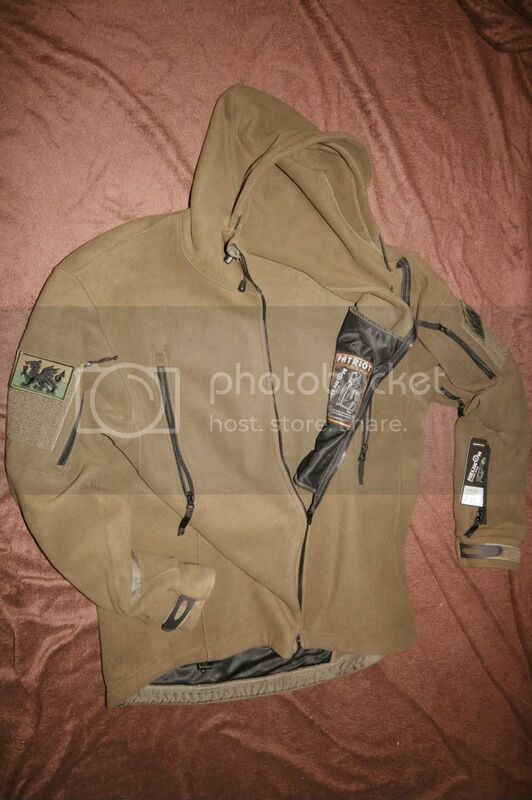 The fleece its self is well constructed with two sleeve pockets (plus 1 forearm), two in the chest one of which has a coin pocket and rather surprisingly a large pocket in the lower back. At first I assumed this was a vent but it is defiantly a pocket – can only assume this is to provide a place for maps either that or handy access for pickpockets! All the zips have tags to make it easy to access wearing gloves and there is an air vent under each arm which can be zipped up or opened as needed. Both arms have badge velcro blanks on them which for some could make them feel a little stiff for general wear especially as the fleece its self is so soft and flexible. After a good few wears though this stiffness soon wears off. The Jacket has an integrated hood which is actually shaped and features a small peak – this makes a nice change from the usual generic bag after thought which is usually tagged on to these kind out jackets, the hood also has drawstrings should you want a tighter fit against the elements, the toggles are threaded through holes in the fleece and although these have stitching around them I do wonder how long they will last before wearing through. But on the plus side the holes are large enough to carry the cable for a set of headphones if you so desired. This fleece has been re-enforced with a much stiffer fabric along the bottom to provide resistance for the drawstrings but actually has the effect of foreshortening the base of the jacket meaning while the top half is roomy the bottom could be a little tight for some. The elbows even have re-enforcing to help prevent wear and tear. After a couple of wears it has loosened up a bit but if you are on the top end of the size measurements then I would recommend you get the next size up to be able to zip up comfortably. Cuffs have rubberized adjusters that are easily used with gloves. All in all this is a great fleece jacket, it could do with being a bit more generously cut along the bottom though and I am not sure how much use the rear pocket will get, but it is practical has ample pocket space for most needs and does an exceptional job at keeping the wearer warm and comfortable. Yosser says: Helikon keep hitting the mark with their kit and this fleece does not disappoint. Warm, soft and extremely comfortable and goes great with the other layering kit such as the Lvl5 Soft Shell they produce. Nice touch having 2 upper arm pockets (most, only have one) and the lower arm pocket on the LHS is really useful for bus tickets or other small items you may need to hand in casual use, although maybe a bit awkward to use for those left handed people.